A trust is a contract between the settlor and trustee, formed for the benefit of a third party. In this contractual arrangement wherein the trustee holds the property of the settler, for the sake of the one or more beneficiary. There are two types of trust, i.e. 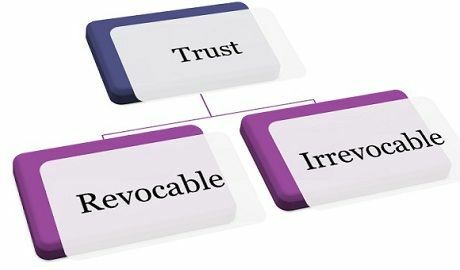 revocable trust – a trust which can be terminated anytime till the author survives and irrevocable trust – a trust that cannot be canceled once created. In a trust, the trustee holds the asset, only as a nominal owner. In India, trusts are governed by Indian Trust Act, 1882 . So, before you get ready for the creation of a trust for your family, first of all, you should learn the major differences between revocable and irrevocable trust. Meaning A trust in which the cancellation is possible during the lifetime of the author is revocable trust. A trust whose cancellation is not possible after it goes into effect is known as an irrevocable trust. Control and power Control and power on the asset transferred remains with the settler. Control and power on the asset transferred does not remain with the settler. Objective Eliminate probate. Eliminate estate tax. Alteration of terms Can be altered anytime. Cannot be altered. Revocable trust refers to the trust which can be modified and canceled at any time during the life of the trust owner. The trust serves two purposes at the same time, i.e. first the trust owner will remain the owner of the asset transferred and exercise control over it, second, the property will be handed over to the named beneficiary, after his death. As the asset belongs to the estate of the grantor, it is taxable. On the event of the demise of the grantor, the revocable trust becomes an irrevocable trust. The main objective of the revocable trust is to avoid the probate process, i.e. it ensures easy transfer of the asset to the intended beneficiaries. An irrevocable trust is a trust that cannot be changed/modified/altered/terminated by the grantor, once the trust deed is signed and comes into effect. Once the asset is transferred to the trust, it cannot be reversed. Therefore, the grantor, cannot exercise control over the asset. The major reason behind entering into an irrevocable trust is that it offers you ultimate asset protection from the creditors, as the asset does not belong to the trust owner anymore. The second cause of creating an irrevocable trust is to prevent the property from being included in the assets of the trust owner. In this way, on the event of the death of the grantor, it provides protection to the assets within the trust from estate tax. A revocable trust is a kind of trust which can be canceled at any time, till the survival of the author. An irrevocable trust is a kind of trust that cannot be canceled, once it comes into effect. In spite of the transfer of the asset, the trust owner can exercise his control and power over the property transferred. On the other hand, in an irrevocable trust, the settlor cannot exercise his control and power on the asset within the trust. The basic purpose of the formation of the revocable trust is to eliminate probate and in the case of the irrevocable trust is to provide protection against the estate tax, as the property transferred into the trust does not remain part of the author’s estate. The terms of the contract can be altered or amended at any time, during the life of the trust owner, in a revocable trust, while the terms of an irrevocable trust cannot be modified. The irrevocable trust provides protection of assets from the creditors. Conversely, revocable trust does not provide such protection of property. As everything has its positive and negative aspects and the same is the case of revocable and irrevocable trust. While the former prevents from probate, the latter protects assets and avoids estate tax. So, if the trust owner wants to make a choice between these two kinds of trust, first of all, he should make it clear that what he wants from the trust, only then the goals of the trust owner can be fulfilled. Before entering into a trust, you should consult an expert, who will advise you regarding the latest amendments in the trust act. Very nicely narrated differences.. I wish to know -Is trust is allowed to accept donations if the purpose for which trust is formed required more funds and resources. If yes, is it tax exempted . ?